SCHARMACH ENTERPRISES. 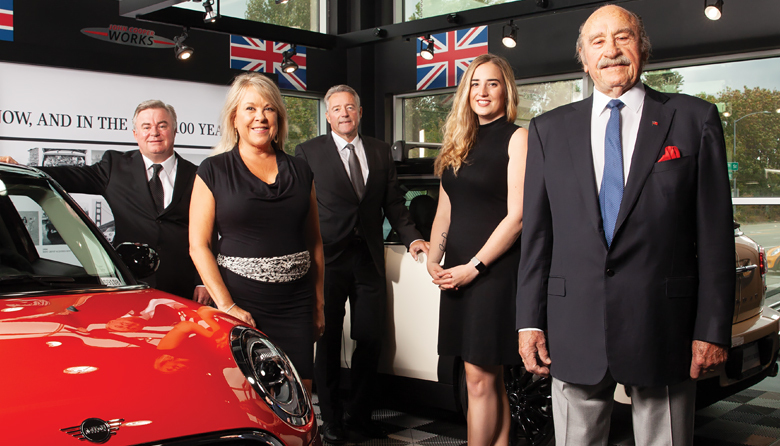 CEO Manfred Scharmach, center, with, from right, founder Werner Scharmach, Madeleine McEntyre, Lori Scharmach and Northwest Mini/Seattle Mini sales director Richard Stone. Scharmach Enterprises noted its 50th anniversary this year. Founder Werner Scharmach built the business after coming to the United States from Germany in 1956 to work as a car mechanic. Today, the enterprise has its largest operations in the Tacoma suburb of Fife along Interstate 5: BMW Northwest, Northwest Preowned Center and Northwest Mini. It also owns the Seattle Mini dealership on Lake City Way. Werner Scharmach was operating an Olympia car repair shop when a BMW importer from New York approached him about opening BMW’s first dealership in Western Washington. The dealership began in Olympia in 1968 before moving to Fife in 1979. Some years later, the company expanded to include the Northwest Preowned Center next door. It added Northwest Mini in 2003 and Seattle Mini in 2009. The business employs 240, and in 2017 BMW Northwest’s staff received BMW Center of Excellence recognition. Werner’s son, Manfred, bought the business in 2002 and Manfred’s daughter, Maddie, works there as well. She was instrumental in launching its business development center, where new employees learn about the company and the industry, customer service and communication skills. Next on the agenda: Manfred Scharmach plans to add a certified collision repair shop. Meanwhile, Werner still enjoys visiting the dealerships on occasion. He and his son talk about larger strategies. “I use him as a sounding board,” Manfred says. Bob’s Heating & Air Conditioning has 305 workers who provide HVAC services within “a culture of doing the right thing.” This core value gets noticed, including Bob’s recent selection as one of Seattle Business magazine’s 100 Best Companies to Work For. A three-generation business, Bob’s is led by President Vern Olson making high-level decisions. Daily operations are left to a general manager, along with three vice presidents: Vern Olson’s daughter, son and a family friend. Each Friday, the executive team meets for lunch to discuss projects, problems and strategies. Through open communication, the company has successfully transitioned family into leadership roles. Today, more than 30 extended family members work in the business. In the past three years, revenues have nearly doubled and the number of employees has grown past 300, even with an industry labor shortage. Bob’s is one of the largest Northwest all-residential HVAC companies.